It was founded way back in 1787 - a fact gathered from a poster for a cricket match in 1837 ….. before then, however, aristocrats and noblemen played their cricket in White Conduit Fields at Islington, London. Like shooting and fox-hunting, cricket was considered a manly sport for the elite - with plenty of gambling opportunities to boot. As London's population grew, so did the nobility's impatience with the crowds who gathered to watch them play. In pursuit of exclusivity, they decided to approach Thomas Lord, a bowler with White Conduit CC, and asked him to set up a new private ground. An ambitious entrepreneur, Lord was encouraged by Lord Winchilsea to lease a ground on Dorset Fields in Marylebone - the site of the modern Dorset Square. He staged his first match - Middlesex (with two of Berkshire and one of Kent) versus Essex (with two given men) - on 31st May 1787. Thus Marylebone Cricket Club was formed. A year later, it laid down a Code of Laws, requiring the wickets to be pitched 22 yards apart and detailing how players could be given out. Its Laws were adopted throughout the game - and MCC today remains the custodian and arbiter of Laws relating to cricket around the world. That is the history of Lords and that of MCC, the governing body – which has just celebrated 200 years of its existence…. And Indian fans will always remember Lords for 25th June 1983 – that famous victory when Kapil Devils successfully defended 183 against the mighty Clive Lloyd’s West Indians .. Krishnamachari Srikkanth was the top scorer and Mohinder Amarnath, the Man of the Match (and Tournament too). Lord's Cricket Ground, generally known as Lord's, is a cricket venue in St John's Wood, London. Named after its founder, Thomas Lord, it is owned by Marylebone Cricket Club (MCC) and is the home of Middlesex County Cricket Club, the England and Wales Cricket Board (ECB), the European Cricket Council (ECC) and, until August 2005, the International Cricket Council (ICC). Lord's is widely referred to as the "home of cricket”. To mark its bicentenary, on 5 July a Marylebone Cricket Club (MCC) XI captained by Sachin Tendulkar played a Rest of the World XI led by Shane Warne in a 50 overs match. Lord's 200th anniversary was a celebration of its greatness, and great players like Tendulkar, Brian Lara, Rahul Dravid, Muttiah Muralitharan, Shane Warne, Adam Gilchrist, Kevin Pietersen, Yuvraj, Sehwag, Shivnarine Chanderpaul and more. 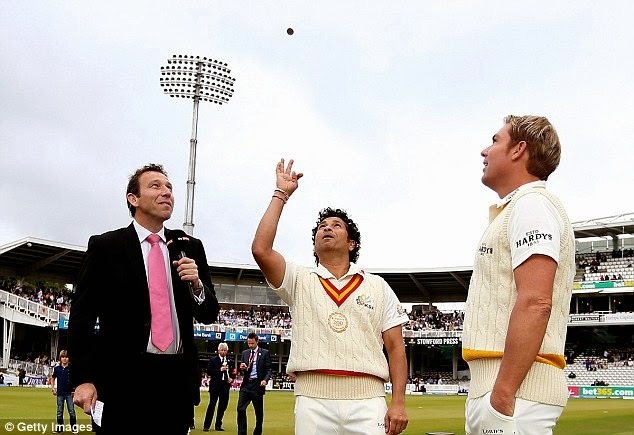 The players took the field in old-fashioned whites and MCC cable-knit sweaters, with only the colours of their caps - Tendulkar's XI in dark blue, Warne's wearing canary yellow - to distinguish sides. Lords web states that MCC's teams play around 500 matches a year. They set off for overseas tours to destinations as diverse as Tanzania and Cyprus to help increase cricket's international appeal; and its women's side have more and more matches too. It is always busy at the famous old ground too. Lord's hosts: Investec Test matches; NatWest One Day Internationals; Middlesex's Twenty20, County Championship and CB40 matches; as well as the showpiece finals for the Clydesdale Bank 40, Minor Counties Cup and National Village Cricket Championship. There are 18,000 Full and 5,000 Associate Members of MCC. Those Members own the Ground and all MCC’s assets (the most famous of which is the Ashes Urn). Red-faced former England captain and Sky commentator Andrew Strauss has apologised to Kevin Pietersen after a foul-mouthed tirade against his former team-mate was accidentally broadcast live. Strauss, at Lord’s believed he was off air during an ad break but was overheard describing South African-born Pietersen as an ‘absolute c***’ on a feed broadcast to Fox Sports. Strauss, also born in South Africa, made the crass remark as Pietersen batted. Sky then tweeted an apology before Strauss went on air to say: ‘I apologise unreservedly, particularly to Kevin Pietersen. I am mortified and profusely sorry.’ A senior Sky insider said there would be no further action against Strauss but there was outrage on social media from fans angered by Pietersen’s England exile after bust-ups with team-mates and officials. Strauss fell out with Pietersen in 2012 after the batsman insulted his captain in text messages to friends in the South Africa dressing room. One could recall that in 2006, Dean Jones, the former Australia Test batsman turned TV commentator, was sacked by Ten Sports, after being heard calling Hashim Amla a 'terrorist' on live television during the fourth day's play between Sri Lanka and South Africa at Colombo. When Amla, took the catch to dismiss Kumar Sangakkara, Jones was heard to say "the terrorist has got another wicket". On the field at Lords, tere was no Sachin Tendulkar hundred, no Brian Lara classic…. –and Shane Warne did not bowl. 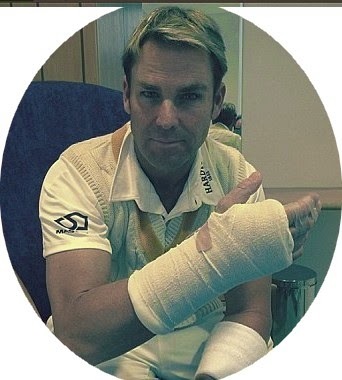 The first ball Warne faced was a beamer from Brett Lee – Warne broke his hand and was unable o bowl. Aaron Finch's unbeaten 181 guided MCC home, trumping a flowing century from Yuvraj Singh. One will remember that Lord's hosted the Archery Competition at the 2012 London Olympic Games. Photo and news credit : Daily Mail; Cricinfo and Lords.org.